I’ve often heard the argument from non-Christians that God is just a crutch for believers. He makes us feel better, gets us through tough times, and helps us deal with things when we can’t handle reality. Well, I guess you could say there can be some truth to that statement. Here’s what I mean by this: God isn’t a crutch, but religion can be used as one. Knowing this truth requires the understanding that being religious and following Jesus are two totally different concepts. With religion you can pray, go to church, study your Bible, and say and do all of the right things. Religion is about us and what we can do to make ourselves look and feel good. Being a true follower of Jesus Christ is realizing that there is nothing we can do anymore–God’s already done it all by sacrificing His one and only Son for our salvation. Everything else in our “church culture” is just extras that can either draw us closer to God or lead us into the dangerous crutch territory of religion. As Christians, we need to examine our intentions in all that we do. Am I going to church to worship God and have fellowship with other believers? Or am I going to make myself look good? Am I reading the Bible to learn God’s truth and grow closer to Him? Or am I cherry-picking verses to feel good about myself? These questions are tough to ask, but then again, Jesus is all about tough love. A crutch does not heal your wounds or transform you; it merely carries you through until something else fixes you. I’ve never seen people who are hobbling on actual crutches get healed by them. They need a doctor to provide treatment for their lives. This is the same concept with religion. Following doctrines and legalism might get us through the hard times and make us feel god. In fact, a lot of people only call on God when they need help. The only true way we can be healed and redeemed from our sin and brokenness is by calling on Jesus, our great physician, and allowing His Holy Spirit to work in our lives. 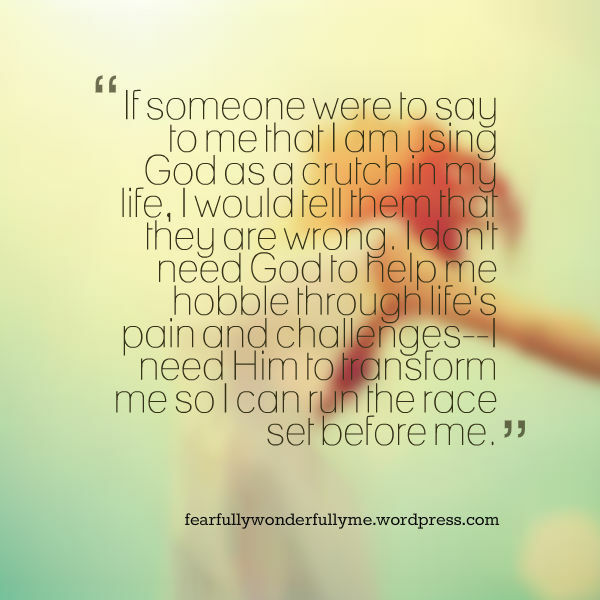 If someone were to say to me that I am using God as a crutch in my life, I would tell them that they are wrong. I don’t need God to help me hobble through life’s pain and challenges–I need Him to transform me so I can run the race set before me. Wherefore seeing we also are compassed about with so great a cloud of witnesses, let us lay aside every weight, and the sin which doth so easily beset us, and let us run with patience the race that is set before us, Looking unto Jesus the author and finisher of our faith; who for the joy that was set before him endured the cross, despising the shame, and is set down at the right hand of the throne of God (Hebrews 12:1-2). Fearfully Wonderfully Me did an amazing job of encouraging Christians to live lives for Christ not for ourselves seeking out religion. Thank you for sharing this blog post with us! That was a very interesting post, thanks for sharing!